What would happen if a nuclear weapon were detonated right over your house? What about right over your school? How about over a well-known landmark? What would survive? How bad would the damage be? What if it were a small “pocket nuke” compared to a 100 Megaton warhead? All of these questions could be answered through the simple web tool Nukemap. 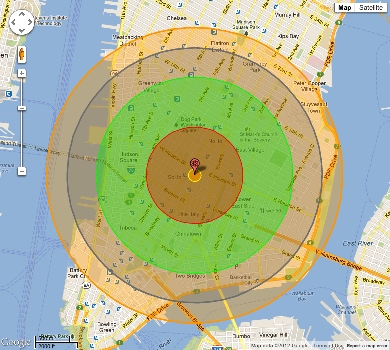 Nukemap uses Google Maps to allow students to choose a location, either a preset city or one of their choosing, and then the size of the device that would detonate. They can either enter a kiloton value o choose from a preset list of about 20 known, historical devices. After they click “Detonate” the tool overlays a series of concentric circles over the map showing the effects radii of the blast. Each comes with an explanation of what would occur within each circle and students can use the zoom feature in Nukemap to pinpoint the exact edge of each circle and can even overlay the satellite image to gain a more realistic idea of the effects of the blast. History – Students can overlay the historical bomb blasts over the actual locations or over your own town or US cities to compare the potential damage. Social Studies – Students can discuss the need for emergency preparedness in the event of an actual detonation using a preset location and estimating the damage and blast effects in their home. Current Events – Students can question how a detonation would affect life in your locality today or what would be the most likely targets should a nuclear war flare up today. Math – Students can compare and contrast the areas of the different effect zones using the radii provided by the maps. They can do this in either a single blast or through multiple blasts that may overlap! Estimate the travel distance to a “safe zone”. Geography – Using the map after a detonation, students must plan a route to escape the blast zone, or plan the route to use to send assistance to those affected, knowing that some roadways will be impassable. English/Writing – Students can create character sketches or small narratives explaining the conditions within each effects radius from a first person point of view. Science – Students can explore either the physics behind the nuclear effects or the chemical and biological reactions to the fallout from the detonation and its affect on the local ecosystem. Also included on Nukemap are additional links to the history of nuclear weapons and warfare and the current state of affairs in regards to nuclear proliferation. There is also information about the physics behind nuclear weapons and warfare to help students gain a better understanding of how these devices function. As always, if you have any other ideas or unique ways that you have used a tool or think you would be able to use one, such as Nukemap, please let me know. I love hearing them!